With all these midterms, exams, papers, school in general, and recovering from Homecoming, you may have thought that crafting has gone by the wayside. But, never fear, dear Glossers (that is the new pet name of College Gloss readers. It will happen. ), I am back with a DIY perfectly suited for expressing your school spirit at our last home football game or maybe the basketball games that just started up! Since we are in the big, bad SEC now, there is a certain sort of etiquette of dress that is encouraged and expected (I mean, I am usually painted up in the front row ... not exactly what the SEC looks for in their female fans). Since Missouri isn’t really the South and we aren’t all into the Southern Belle SEC look, accessories can make us SEC worthy. 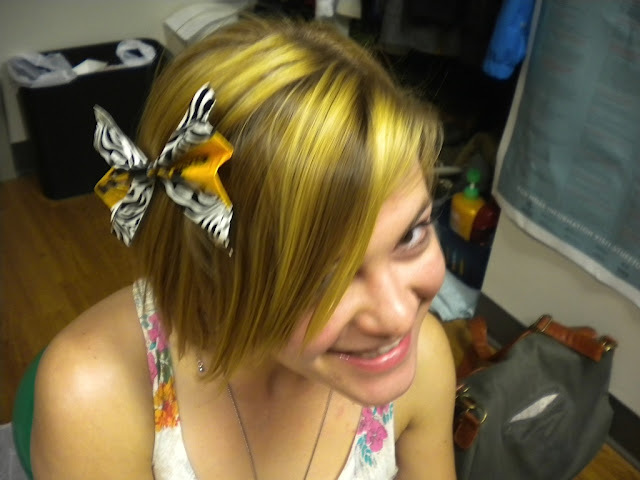 Hence, the duct tape hair bow. It is the perfect mix of Mizzou ingenuity and attitude with Southern class. You can look fabulous and show your spirit! Plus, making them is the perfect study break (or study substitute ... shhhh). 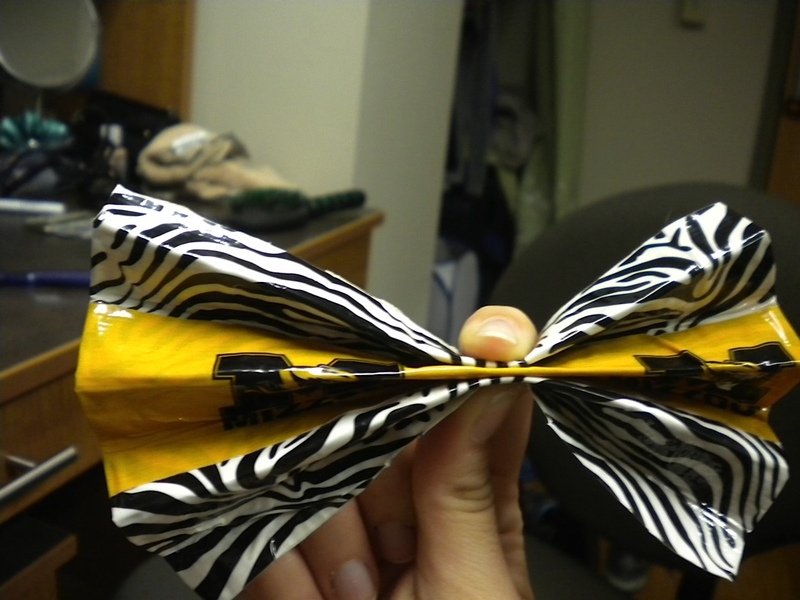 My bow is pretty big with three pieces of tape overlapped, but it can obviously be modified for two levels or just one level of tape if you aren’t ready to take on the big spirit bow. You start by unrolling what you want to the the center layer of your bow, which for me is the Mizzou logo tape since I want that to be the in the middle. 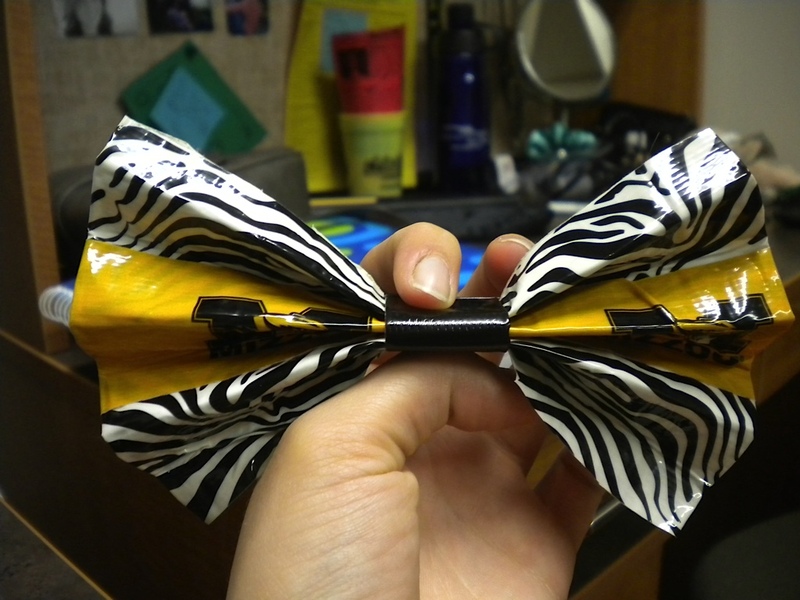 Since I wanted my bow to be pretty obnoxious, the piece of tape I unrolled was about a foot long. Carefully set that piece down, sticky side up. 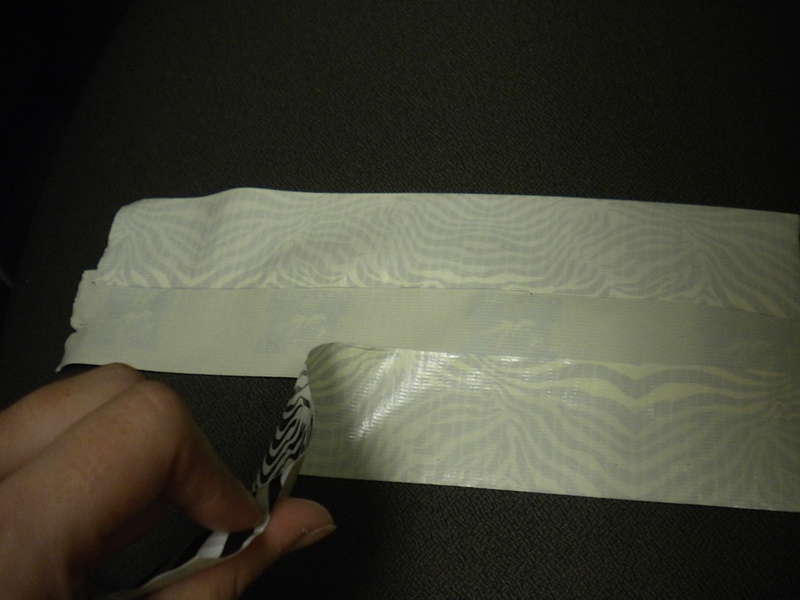 Cut the other two layers of tape (for me the two pieces that are zebra/tiger stripe) out in the same fashion, making sure they are about the same size as your first one. Don’t sweat if they aren’t perfect as duct tape isn’t perfect. 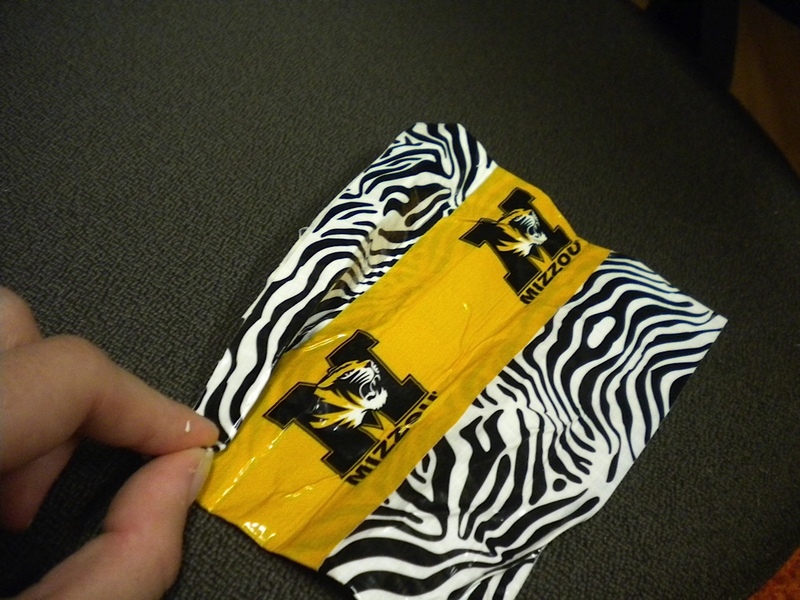 To create the three tier effect that I mentioned, take the zebra/tiger stripe pieces of tape and stick it on the Mizzou logo piece (everything sticky side up) so that they are overlapping. This is decision time for you, reader. YOU decide how much of the top layer you want to show based on how much of the top layer you stick on the middle layer. Do the same thing with the bottom zebra/tiger stripe piece. Now you have all three layers stuck together with the sticky sides all up. Take one of the ends and fold it into about the halfway point in the length of the tape. Once again, if it is not perfect, it won’t matter. 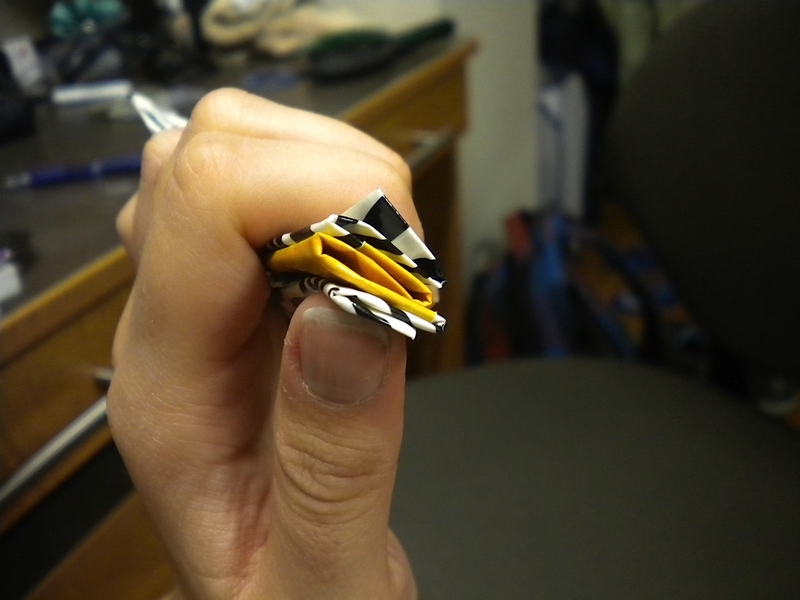 Fold the other side in to meet it. Now all the stickyness is gone and both ends of the bow will have nice, folded edges. Remember elementary school art class? You are going to use that background knowledge to fold your piece of tape accordion style lengthwise. This means you fold a section of the tape down and then fold a section of the same size back until you have gone down the entire height of the tape. 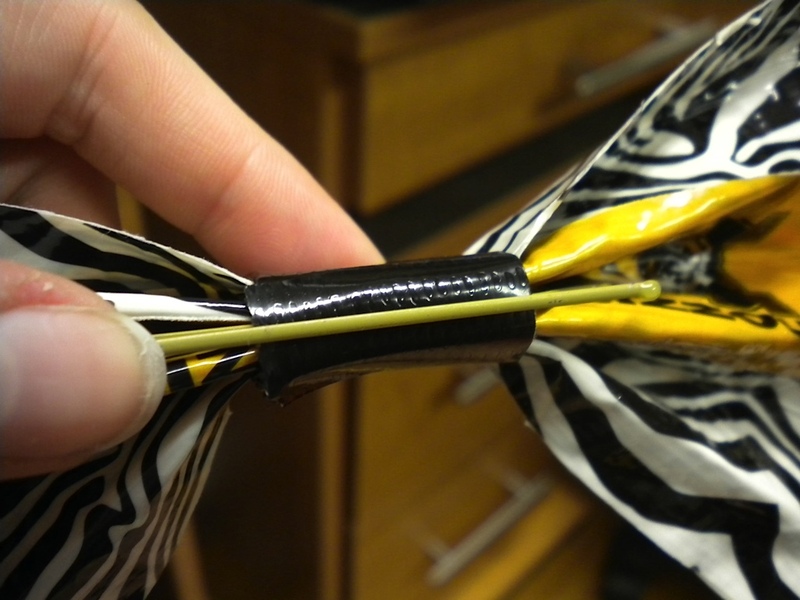 Now that you have this folded-up piece of tape, pinch the middle of the piece so that the two sides fan out equally-ish on each side of where you are pinching. Cut a thin piece of tape (for my big bow it was about an inch in width) and wrap it around the area you were pinching to create the center of your bow. To make it functional, grab one of the millions of bobby pins that are lying on your floor, bottom of your drawer or shower caddy and slide it bumpy side up through the center loop of the bow on the side that is the back (you choose depending on what side looks better or least crappy if it is your first time making the bow ... no shame). Voila! Stick that puppy in your hair and you look fashion-forward and ready to cheer on the Tigers. Alternative ways to wear it is taping or hot gluing the bow to an old headband or connecting it to a strip of tape that is folded so no sides are sticky that can wrap around your neck as a bow tie! These don’t take long to make so you can make a different one for every game (basketball season is here!). I am sure Truman will be very impressed! 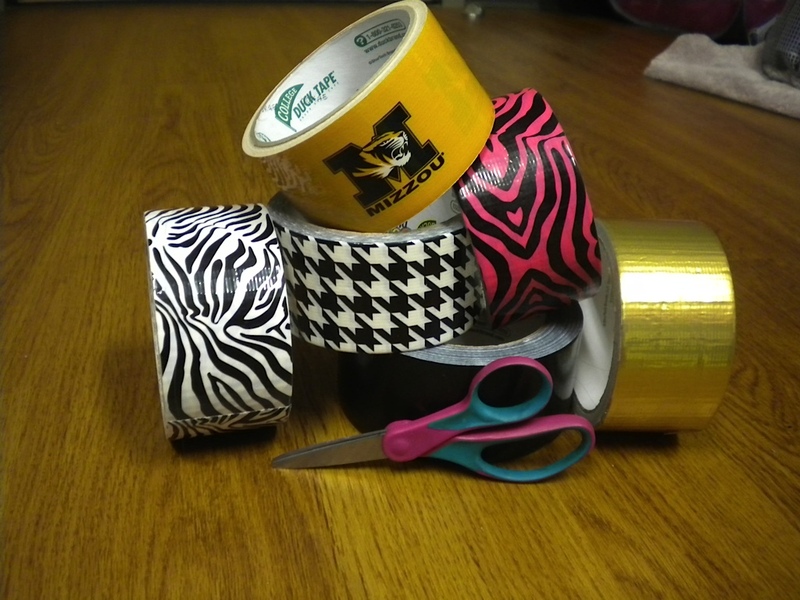 As always, happy crafting and go Tigers! MIZ!